Master Sgt. Daniel Magas (top right) stands for a photo with the rest of his platoon at the U.S. Marine Corps Senior Noncommissioned Officer Academy Advanced Course Sept. 28, 2016, at Camp Lejeune, N.C. When it came time for Master Sgt. Daniel Magas to attend the next step in his Professional Military Education — the Air Force Senior Noncommissioned Officer Academy — he decided to take a different route. Magas, the commandant of the Airman Leadership School at Edwards Air Force Base, Calif., decided to attend the U.S. Marine Corps Advanced Course in lieu of the Air Force Senior NCO Academy. “There are limited seats offered to the Air Force annually by the U.S. Marine Corps. I simply wanted a challenge, and I felt the Corps would be more than willing to oblige,” said Magas. 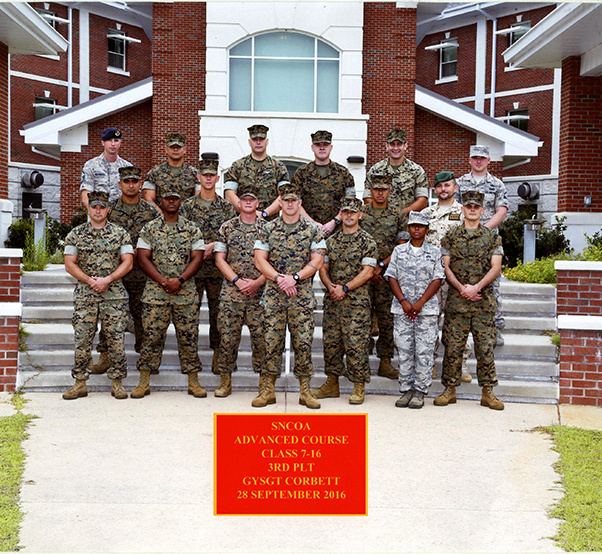 After being nominated by his Air Force chain of command, Magas was selected and joined 84 other students for the 52-day Marine course at Camp Lejeune, N.C. Eight other airmen and a Slovakian military member also attended the course. Obviously, working with the mostly sea- and land-based force would be different from an Air Force course, he said. One particular subject at the course Magas recalled was a Revolutionary War battle study, which had the students spending most of the day in the classroom researching tactics and maneuvers of the Battle of Moore’s Creek Bridge. After that, the class took a trip to the battle site to walk the grounds in the North Carolina swamp to research the terrain and stand over the graves of Revolutionary War-era soldiers. Magas said one of the bigger things he took away from the Marine course was the increased feeling of pride to be a senior NCO and the pride exuding from his Marine classmates and the value they held for lower enlisted Marines, who were to be trained by senior NCOs so they may one day take their places. “The Corps is big on not just wearing the rank but fulfilling your role as a senior NCO regardless of who’s standing in front of you. It’s fair to say that I look at a lot of things differently now. You’re not just a gunny or master sergeant, you’re “The Gunny,” and the example is yours to set. The course fulfills Magas’ senior NCO professional military development requirement and turned out to be a highlight in his Air Force career, he said.